Meria is available for one on one consultations/classes via the telephone, Skype,Facetime or in person. Would you enjoy speaking with Meria for an hour or a half an hour? You can discuss anything going on in your life, the world or beyond. Meria mixes her intuition, business experience and life experience to be the best “intuitive” coach you can possibly find. Meria considers herself a TEACHER first and foremost. She has taught Native American spirituality for close to 30 years now and is the Founder of the Universal Medicine Wheel. 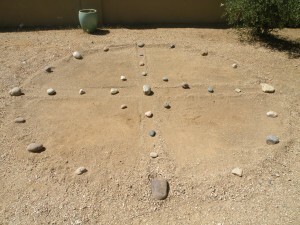 She has taught metaphysics in New York, Arizona and Europe too.Meria is a Usui Reiki Master. Meria has been doing “readings” professionally since 1985. Meria uses her intuitive gifts daily to decipher the truth about what’s going on in the world, which she presents here on The Meria Heller Show and has since July of 2000. This is how it works: By arranging a consultation with Meria by going to Pay Pal and making payment to her account: Meria@Meria.net you are agreeing to open your Akashic Records to Meria. 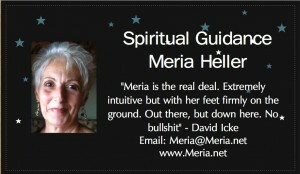 (subscribers to the Meria Heller Show get $50 off either the 15 min or 30 min session). Hi Meria,You mentioned during last phone session that I should ask my hypnotist to take me back when I was 8 years old and even that had to do with water. Well it worked!!! There were a lot of blocks that originated in that event, when I was drowning, there were a lot of things about low self esteem etc. Going to that event allowed me to get to the core of the problem, whereas without going directly to that age I don’t think I would have been able to solve that as quickly in hypnosis. -E.
As I always say on the show “the only ticket out of the madness is a spiritual one”. Hopefully you are staying strong in your own spiritual journey of choice to stay balanced in a world that seems to have gone mad!